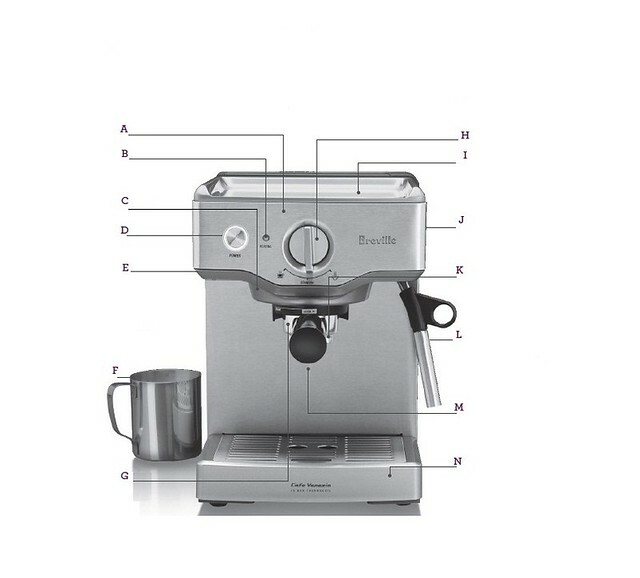 The Breville Café Venezia Espresso Machine — A powerful machine in one small package. Easy Eject filter system allows user to effortlessly change between three filters. 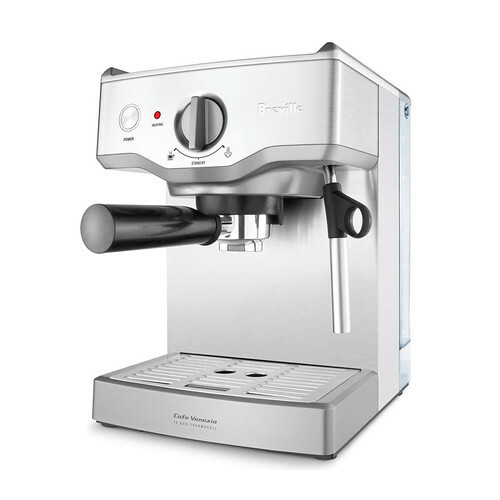 Makes delicious cappuccinos, lattes, mochas, and more. Includes stainless steel frothing pitcher. A. Thermocoil Heating System. B. Heating Light. C. Auto Purge™ System - for optimal coffee extraction. D. Power Button. E. Cleaning Tool Storage - located at the front of the machine under the left of the group head. F. Milk Frothing Jug. G. Advanced Dual-Wall Crema System - for ideal crema. H. Selector Control - for espresso or steam function. I. Die-Cast Cup Warming Tray. J. Stainless Steel Housing. K. Easy Eject™ Filter System. L. 45° Pivoting Steam Wand - with stainless steel frothing attachment. M. 4.5" Head Elevation - for full sized mugs. N. Removable Drip Tray - with stainless steel grid. 93 fl.oz removable water tank with hinges handle. Single, Double, and pod stainless steel filters.